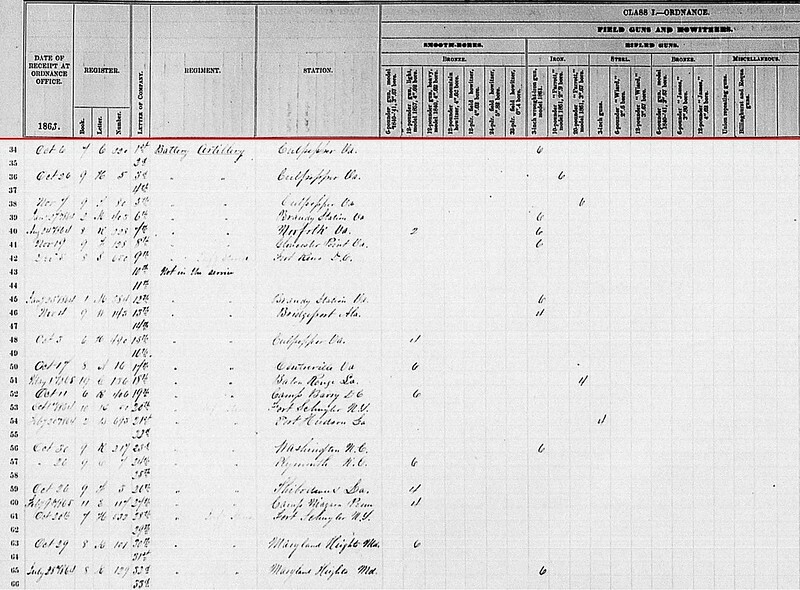 “Lieutenant – Stores in Charge”: The unnamed lieutenant was at Gloucester Point, Virginia. 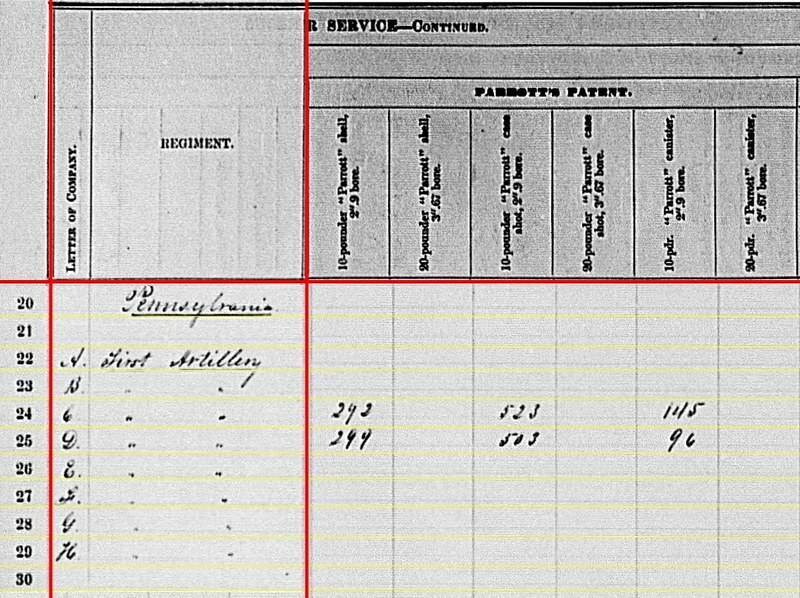 With several artillery batteries, in particular some New York batteries, at that station, one wonders why the stores were not distributed to the artillerists. 100th New York Infantry: Reporting a pair of 6-pdr field guns at Morris Island, South Carolina. 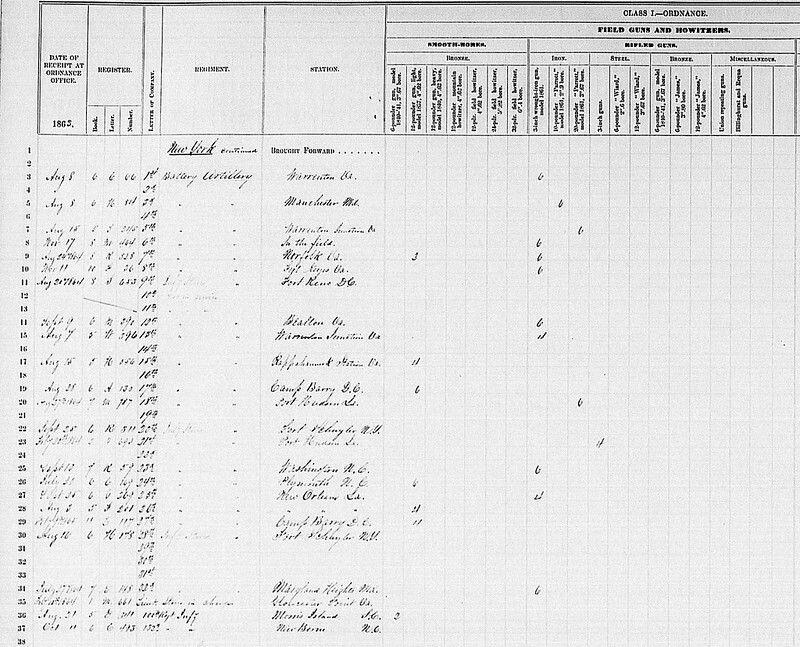 Of course, as of June 30, the regiment was actually on Folly Island, across the Stono River. They would land on the southern end of Morris Island on July 10. These guns were not part of the masked batteries on Folly Island. More likely the 6-pdrs were assigned to the works securing the southwestern end of the island. 132nd New York Infantry: The regiment was stationed at New Bern, North Carolina at this time. No cannon on hand. Just stores and equipment. With so many artillery batteries stationed there, we must again wonder why the infantry was stuck with this charge. There are, however, two light batteries which escaped the tallies of the clerks in Washington. And that was not due to some administrative oversight. Rather, that battery’s service, as a mustered “Federal” battery, was very brief. 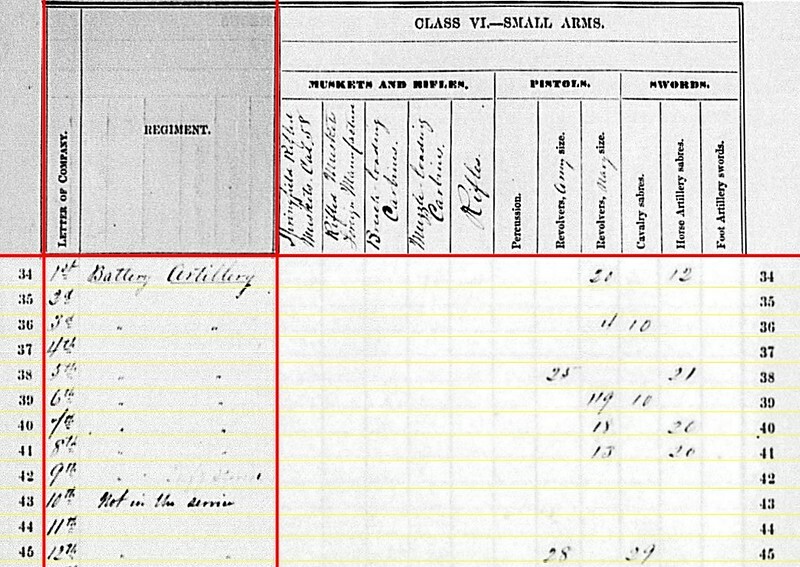 Colonel William B. Barnes received authorization to recruit the 11th New York Artillery Regiment in February 1863. Handbills and newspaper announcements proclaimed this regiment would man the fortifications around New York City, with promises of no marches or backpacks. Good duty if you can get it! By June, Barnes had upwards of 1,000 recruits at Rochester, New York. Then the other shoe dropped. With reports of Confederates moving into Pennsylvania, authorities in Washington and New York reached for any and all resources to meet the threat. Among those was the 11th New York. 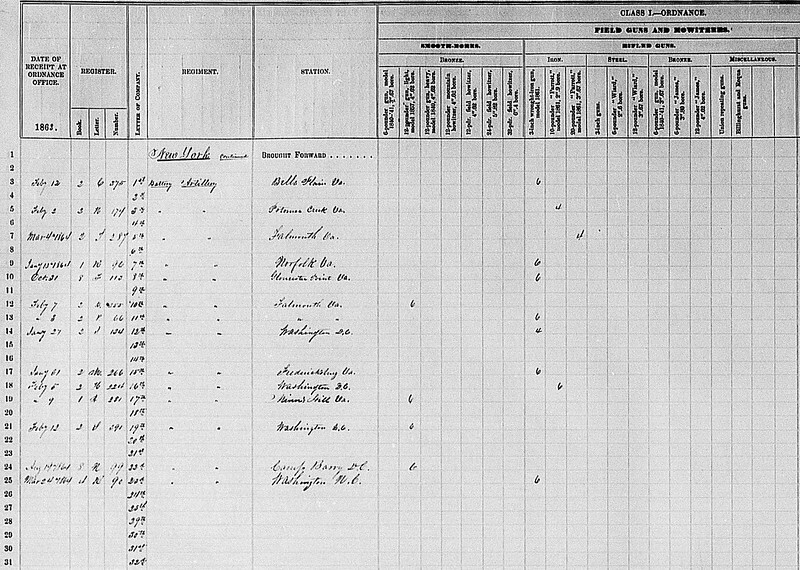 On June 15, orders came for the regiment to report to Harrisburg, Pennsylvania. Before that could happen, the mustering officer culled out unfit or otherwise unqualified recruits. 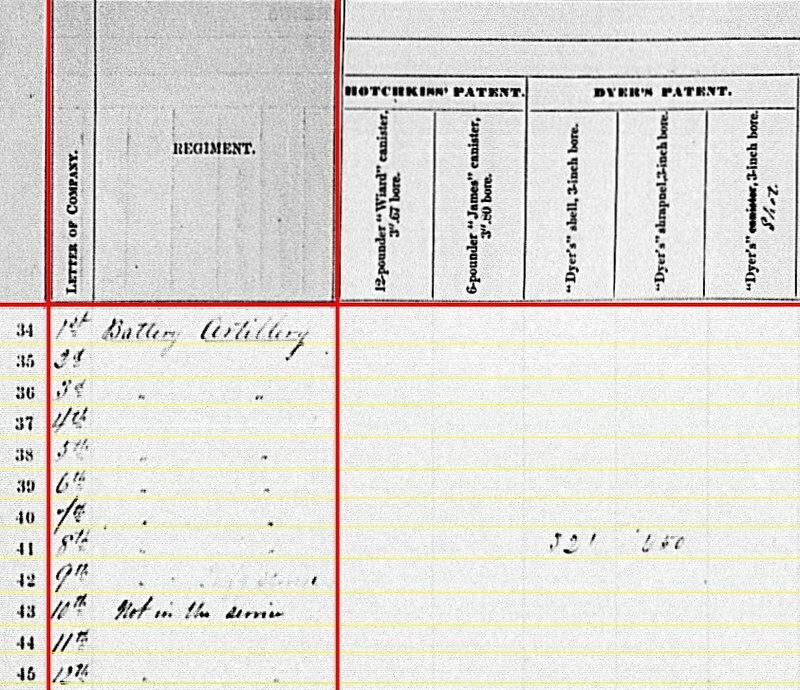 This limited the regiment to just four batteries – A, B, C, and D.
Goodwin’s Battery. – Capt. Goodwin is recruiting in this city for a Battery to be attached to the 11th Artillery. His company is nearly half full, and he hopes, in the course of a few weeks, to be in position to take the field. His guns – his own invention – have been warmly approved by leading artillery officers and accepted by the Government. They are breech-loaders, and are claimed to have the widest range of any in the world. They have projected a ball the enormous distance of six miles, and can be fired at the rate of fifteen times a minute. Capt. G. assures us that they can be fired fifteen hundred rounds without cleaning or swabbing. Capt. Goodwin is an officer of high character and large experience in the science of gunnery, and his Battery is destined to make its mark. 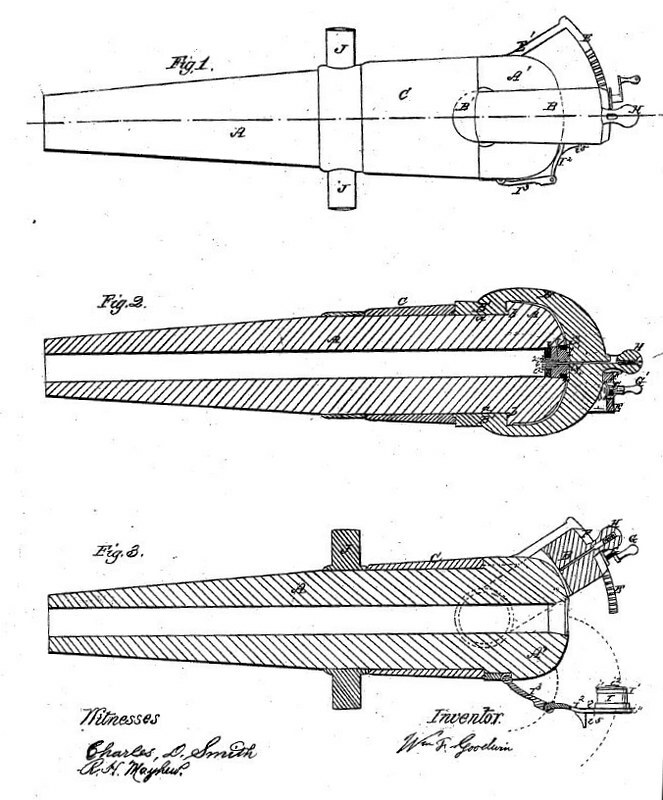 Goodwin’s design included a breech plug, lined with rubber or other material. That was forced into a seat with a breech piece swung horizontally on a yoke. I’ll offer more details separately, but the main point today is this was of Goodwin’s own design. 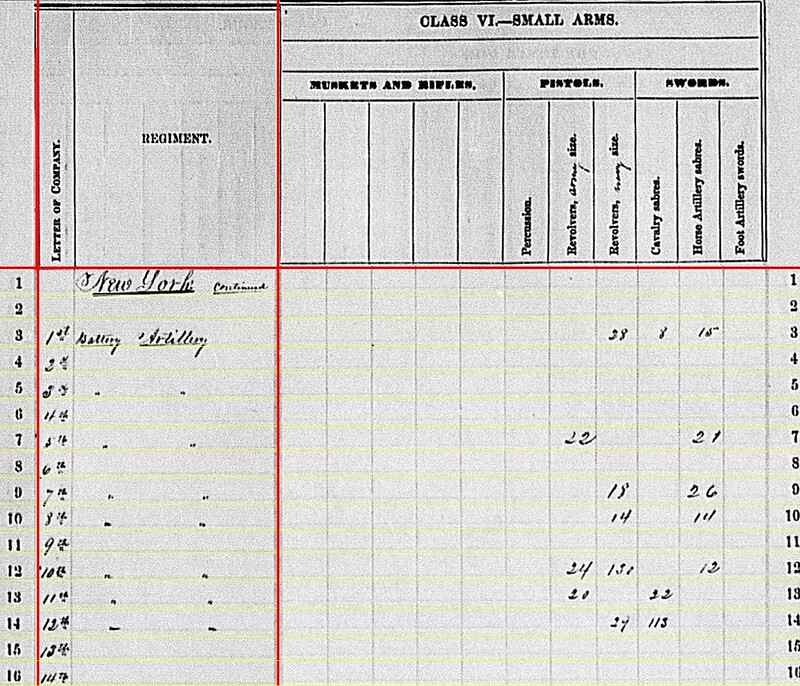 Thomas’ report confirms Goodwin’s Battery did serve as field artillery during their brief active service. Furthermore, we have some indication as to the caliber of weapon, if indeed those were of Goodwin’s design. While not precise, the 10-pounder label is often used for 3-inch caliber. 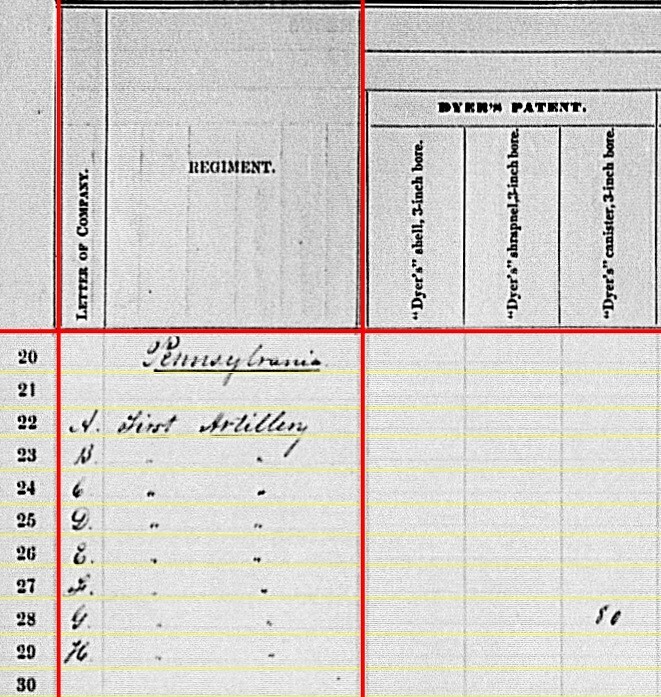 While Batteries A, B, and C of the 11th proceeded back to New York, Battery D briefly served in Pennsylvania. By the end of July all were back in their home state, serving at Fort Richmond (Battery A), Fort Hamilton (Batteries B and D), and Sandy Hook (Battery C). The 11th was mustered out shortly afterwards, but remained on state rolls. Because of the brief, perhaps only six weeks in total, service of Battery D, we do not see them recorded on this summary. The second of these militia batteries caught up in the emergency was Varian’s State Militia Battery. This battery had served in Maryland and Virginia in the earliest days of the war. When it mustered out on July 20, 1861, conveniently missing First Manassas, the guns remained behind while the men returned to New York. It was reorganized as a battery in the 8th Regiment, New York National Guard. In June 1863, the regiment, with the battery attached, was mustered into service for thirty days. It would advance as far as Carlisle, Pennsylvania as part of First Division, Department of the Susquehanna. The battery was mustered out of Federal service on July 23, 1863, returning to its state assignment. 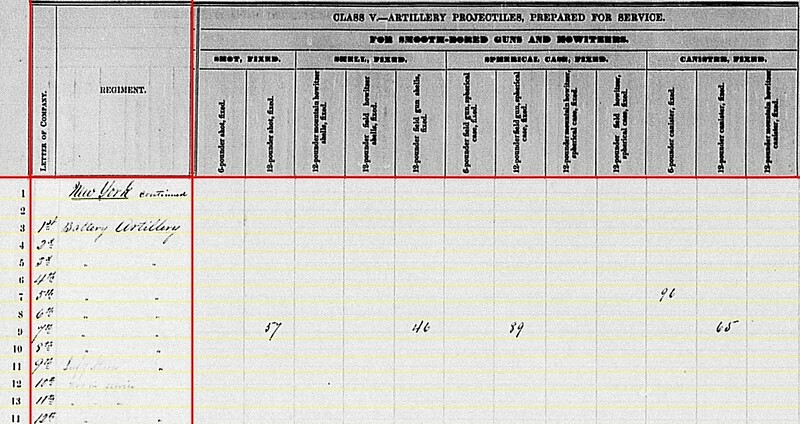 100th New York Infantry: 40 shot, 40 case, and 20 canister for 6-pdr field guns. Ample supply for a couple of guns guarding the approaches to Folly Island. 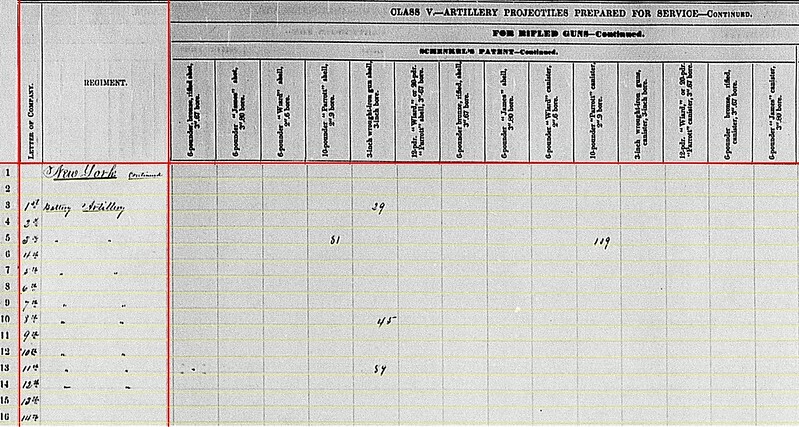 132nd New York Infantry: 26 shot, 20 percussion shell, and 40 fuse shell for 2.6-inch rifles, presumably Wiard 6-pdrs. Gloucester Point: 73 Dyer’s shrapnel for 3-inch rifles. Gloucester Point: 299 Shenkl shell for 3-inch rifles. As a taxpayer, I am profoundly irritated, 150 years after the fact, at this gross wastage. Why weren’t these 372 projectiles simply transferred over to the 8th New York Independent Battery? Instead, some lieutenant wasted his time, and my tax money, accounting for and maintaining this pile of shells! If only the Ordnance Department were as “vigorous” for accounting of Goodwin’s Battery! Things never seem to change, do they? Turning to the small arms we see….. Nothing. 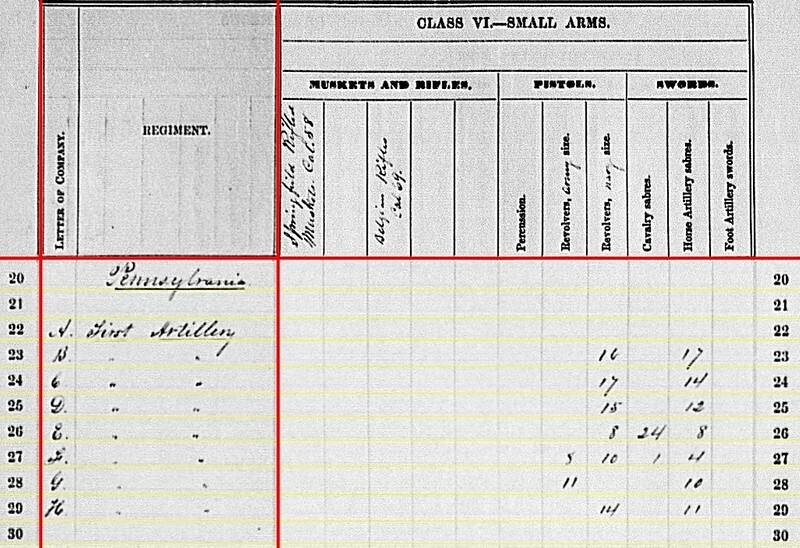 Of course, these units would report their small arms on a separate report specifically for infantry weapons. Thus concludes New York for the second quarter of 1863. Up next… OHIO! 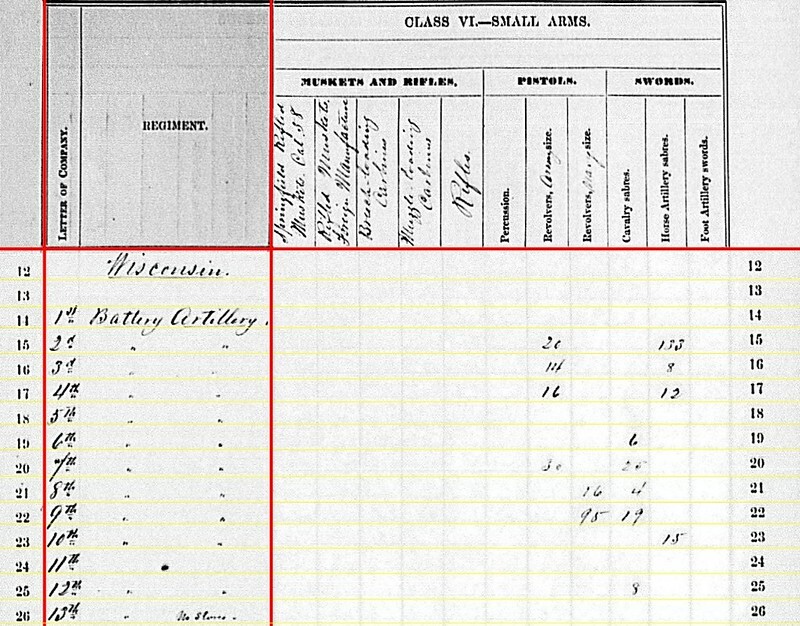 1st Independent Battery: At Warrenton, Virginia with six 3-inch Ordnance Rifles. The location probably reflected the August reporting date. Captain Andrew Cowan remained in command of the battery, assigned to Sixth Corps, Army of the Potomac. On June 30, the battery was at Manchester, Maryland, with a long march toward Gettysburg in their immediate future. On July 3, Cowan’s battery helped repulse Pickett’s charge, firing their last canister – double canister, that was – at 20 yards. 2nd Independent Battery: No return. The battery mustered out, in New York, on June 13, 1863. Captain Hermann Jahn was last in command. The men with time left on their enlistments transferred to Battery I, 1st New York. A reorganized 2nd Independent was authorized, but instead was made part of the 15th New York Heavy Artillery. 3rd Independent Battery: At Manchester, Maryland with six 10-pdr Parrotts. The battery was part of Sixth Corps, under Lieutenant William A. Harn. The battery saw less action at Gettysburg than Cowan’s, being positioned along the Taneytown Road. 4th Independent Battery: No return. Captain James E. Smith’s battery had six 10-pdr Parrotts when placed in defense of the Devil’s Den on July 2. They were, of course, assigned to Third Corps. We are familiar with the 4th, thanks to their stand at the Devil’s Den at Gettysburg, and know they had six 10-pdr Parrotts. By the end of the day, the battery would have only three of those Parrotts (and one was on a disabled carriage). Smith reported firing 240 rounds during the battle. 5th Independent Battery: At Warrenton Junction, Virginia (reflecting the August report date) with six 20-pdr Parrotts (increased from four over last quarter’s report). This was Captain Elijah D. Taft’s battery in the Army of the Potomac’s Artillery Reserve. And as such was near Taneytown, Maryland on June 30. Taft’s battery went into action defending the cemetery on Cemetery Hill. In the action, the battery had one Parrott burst, while expending 80 Schenkl percussion shell, 63 Schenkl combination-fuse shrapnel, 32 Parrott shell, and 382 Parrott shrapnel. 6th Independent Battery: “In the field” and with six 3-inch Ordnance Rifles. Captain Joseph W. Martin held command of this battery, assigned to the First Brigade, Horse Artillery, Army of the Potomac. Martin’s battery lost three guns on the field at Brandy Station. After that battle, the battery was sent to Washington for refitting. 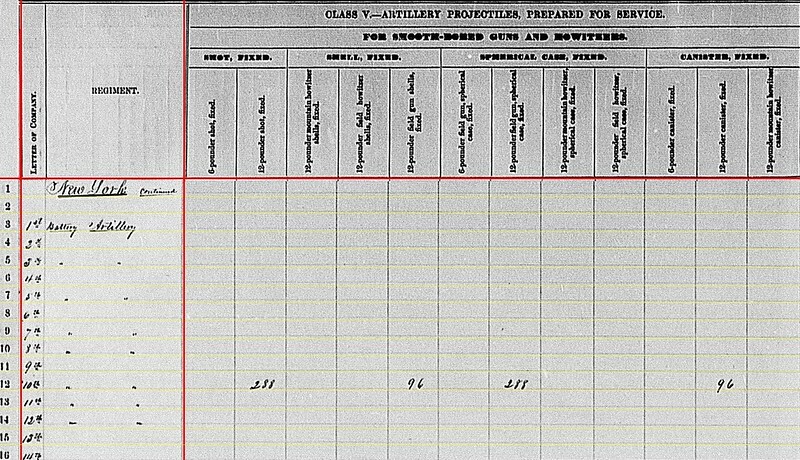 Rejoining the army on June 28, the battery had a full complement of guns. A remarkable testament to the depth of Federal logistics at this time of the war. 7th Independent Battery: At Norfolk, Virginia with three 12-pdr Napoleons (added during the quarter) and six 3-inch Ordnance Rifles. Captain Peter C. Regan’s battery supported the Seventh Corps. 8th Independent Battery: At Fort Keyes, Virginia with six 3-inch Ordnance Rifles. Captain Butler Fitch commanded this battery. In the previous quarter, the battery reported at Yorktown. The Fort Keyes assignment indicates it moved across the York River to Gloucester Point. 9th Independent Battery: Fort Reno, District of Columbia, with only infantry stores. Captain Emil Schubert remained in command. Battery assigned to the Twenty-Second Corps, defending Washington. 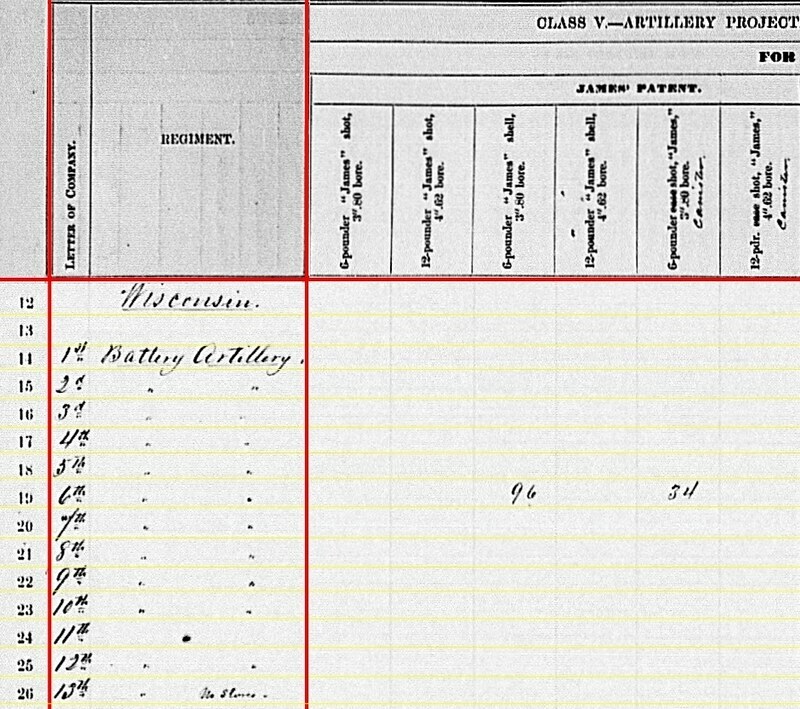 As indicated, the battery was not equipped as light artillery. 10th Independent Battery: Marked “not in service.” In May, the battery transferred from Third Corps to the Artillery Reserve, Army of the Potomac. And in June, the battery was sent to Washington. Members of the battery were transferred to four different batteries, none of which were from New York. Captain John T. Bruen remained commander, but was absent for much of May. Lieutenant Samuel Lewis was listed in command through early June. Then Lieutenant Charles T. Bruen picked up the assignment. For all practical purposes, the 10th Battery was “cross leveled” to bring other batteries up to strength. 11th Independent Battery: No return and dittos for “not in service.” This battery moved from the Third Corps to the Fourth Brigade, Artillery Reserve in May 1863. On, or about June 16, what remained of the battery was attached to Battery K, 1st New York Light. Not until the end of the year was the 11th Battery brought up to strength. Captain John E. Burton was, on the rolls at least, in command. 12th Independent Battery: At Bealton, Virginia reporting six 3-inch Ordnance Rifles (an increase from four reported the previous quarter). The location reflects a September reporting date, by which time the battery had not only moved, but also changed organizational assignments. As of June 30, the battery was at Camp Barry, Washington, D.C. Later in the summer, the battery transferred to Third Corps. Captain George F. McKnight remained in command. 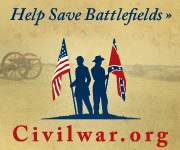 So five of the twelve were directly involved with the Gettysburg Campaign. Two other batteries had attachments at Gettysburg. Only one battery had Napoleons, and we see their chests accounted for here. But what of the other line? 5th Battery: 96 canister for 6-pdr. 7th Battery: 57 shot, 46 shell, 89 case, and 65 canister for 12-pdr Napoleons. Taft’s Battery had 20-pdr Parrotts, with a bore diameter of 3.67-inch, which is the same as a 6-pdr smoothbore. 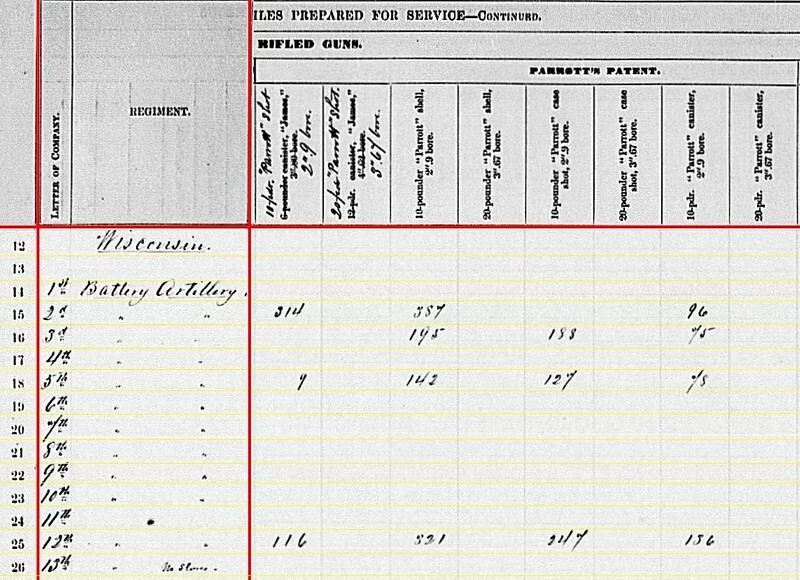 However, in an otherwise detailed report for Gettysburg, Taft does not mention the use of that ammunition type. So, was this reflective of Taft receiving, after Gettysburg, some 6-pdr stocks? 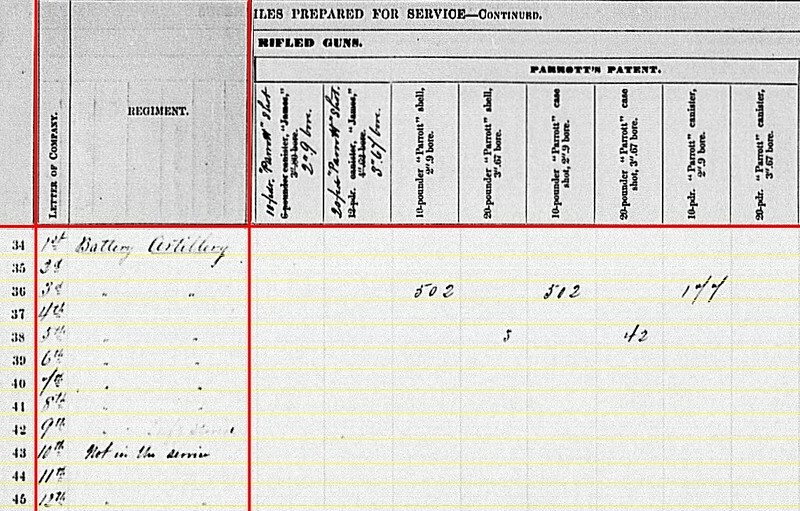 Or did he take 6-pdr canister to Gettysburg? We also cannot rule out clerical error (at the battery or in Washington)… or for that matter that someone in the battery mistakenly identified Parrott canister as smoothbore type (hard to imagine… but a possibility). 1st Battery: 126 canister, 7 percussion shell, 3 fuse shell, and 456 bullet shell for 3-inch rifles. 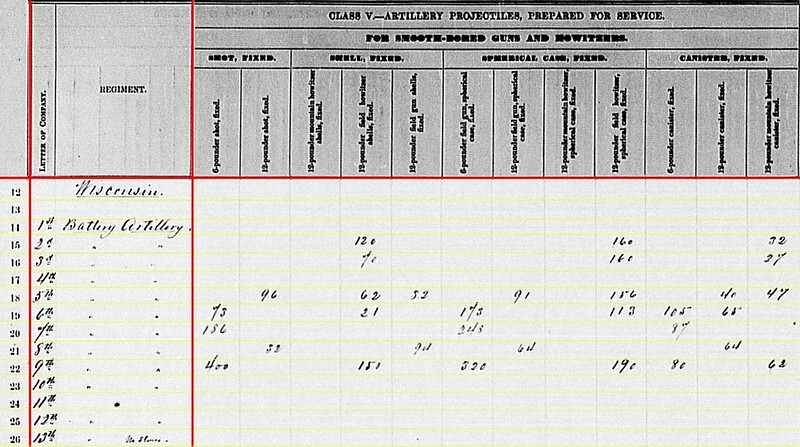 7th Battery: 152 canister, 64 percussion shell, 239 fuse shell, and 675 bullet shells for 3-inch rifles. 8th Battery: 66 canister for 3-inch rifles. 12th Battery: 60 canister, 65 percussion shell, 126 fuse shell, and 366(?) bullet shell for 3-inch rifles. And as with many of these reports for the second quarter, we have to ask if these are quantities reported strictly “as of June 30″…. or at a time when the officers got around to doing the paperwork. 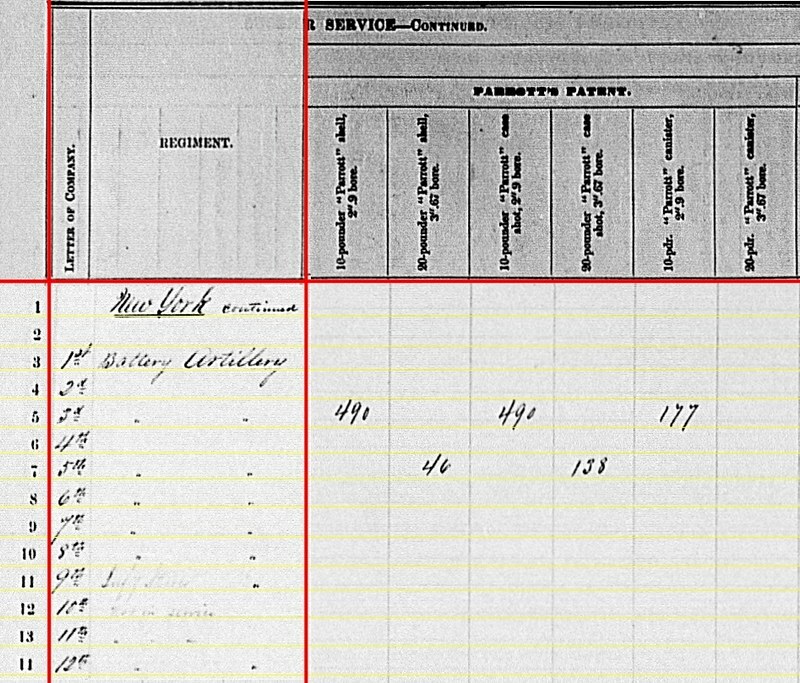 Those numbers could tell us about the battery’s state prior to Gettysburg, or just after, as the case may be. There isn’t a way to say for sure. 1st Battery: 571 Dyer’s Shrapnel in 3-inch rifle caliber. 5th Battery: 4 Dyer’s Shrapnel in 3-inch rifle caliber. 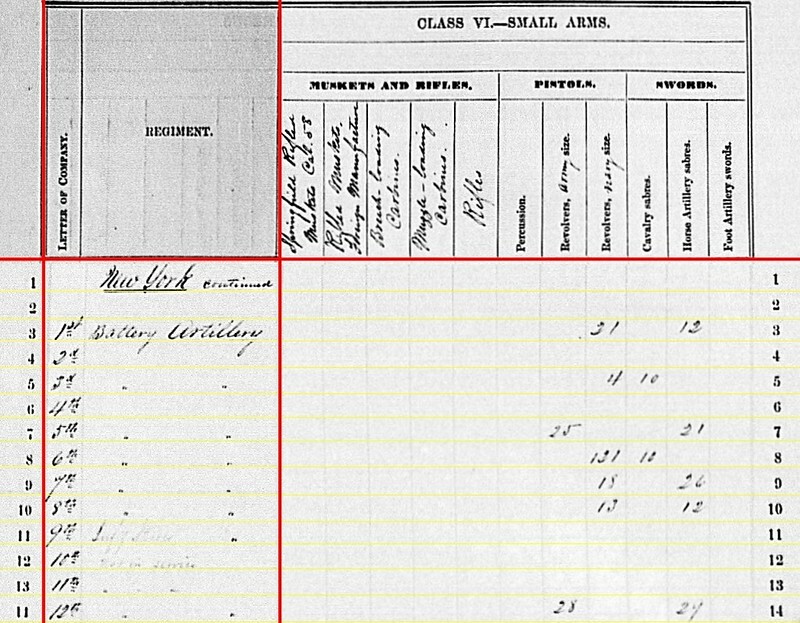 8th Battery: 369 shell, 650 shrapnel, and 109 canister, Dyer’s patent, for 3-inch rifles. I cannot explain why 5th Battery would need 3-inch shrapnel. Perhaps a transcription error. 3rd Battery: 490 shell, 490 case, and 177 canister for 10-pdr Parrotts. 5th Battery: 46 shell and 138 case for 20-pdr Parrotts. Of course, missing, as their return was not recorded, is 4th Battery. Would be interesting to account for what Smith’s Battery took into action on July 2, compared to what was on hand July 3… or later when replenished. 1st Battery: 37 shell for 3-inch rifles. 3rd Battery: 67 shell for 10-pdr Parrotts. 5th Battery: 84 shell for 20pdr Parrotts. 6th Battery: 654 shell for 20-pdr Parrotts. Yes, 20-pdr. 8th Battery: 45 shell for 3-inch rifles. 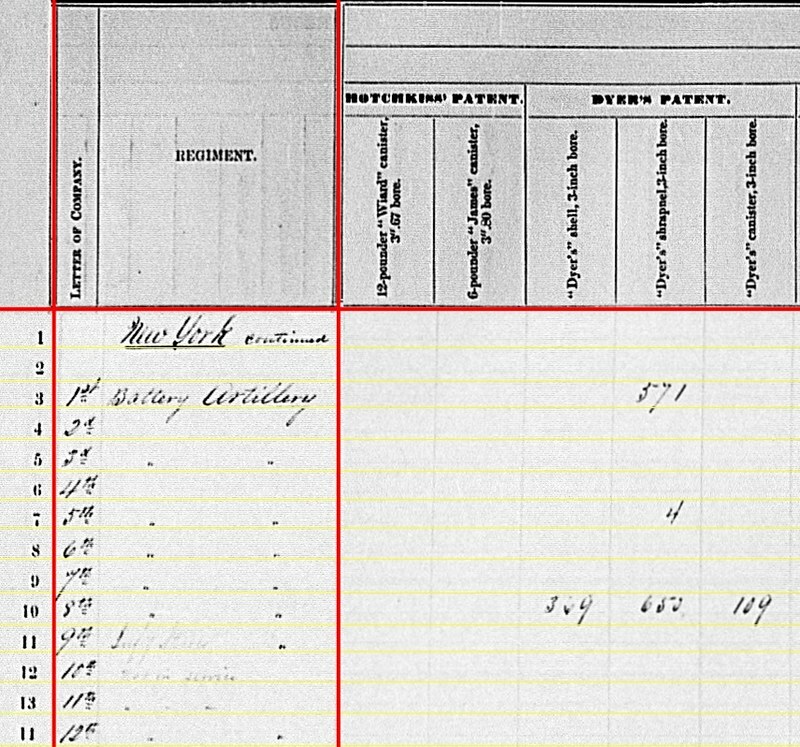 The entry for 6th Battery may be a transcription error, just one column over from where it should be. 1st Battery: Thirty-one Navy revolvers and twelve horse artillery sabers. 6th Battery: 131 Navy revolvers and ten cavalry sabers. 7th Battery: Eighteen Navy revolvers and twenty-six horse artillery sabers. 8th Battery: Thirteen Navy revolvers and twelve horse artillery sabers. The first dozen independent batteries served in the Eastern Theater, with close association with the Army of the Potomac. The next dozen, from the 13th to 24th Independent, saw much more diverse service. We’ll look at those next.